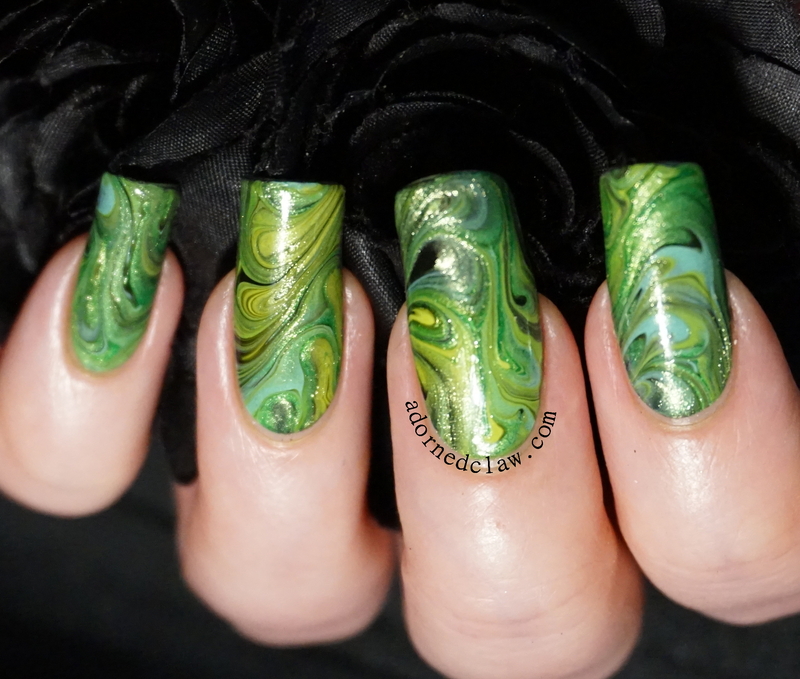 Green Swirly Dry Marble Nail Art! 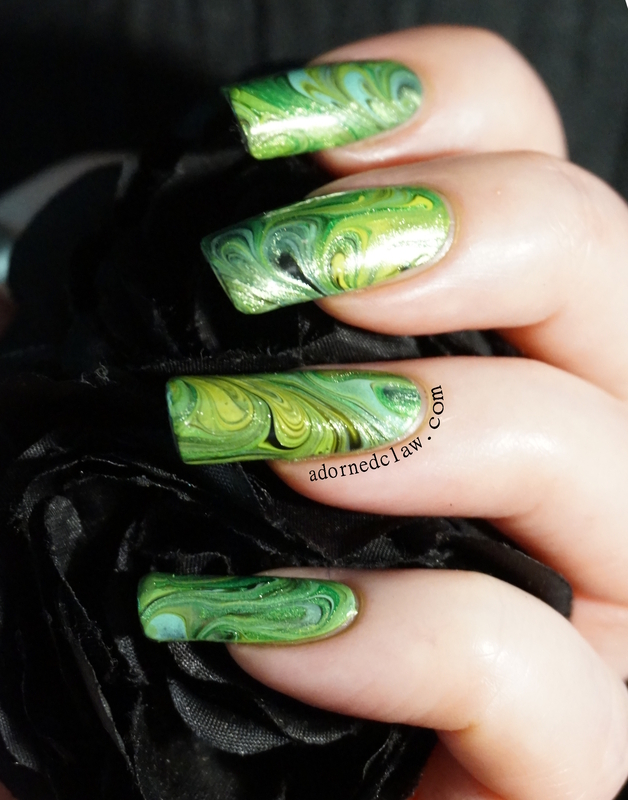 The Lovely people from Born Pretty Store have sent me a marbling comb to play with! After a few attempts to get it to work, this is what I came up with! 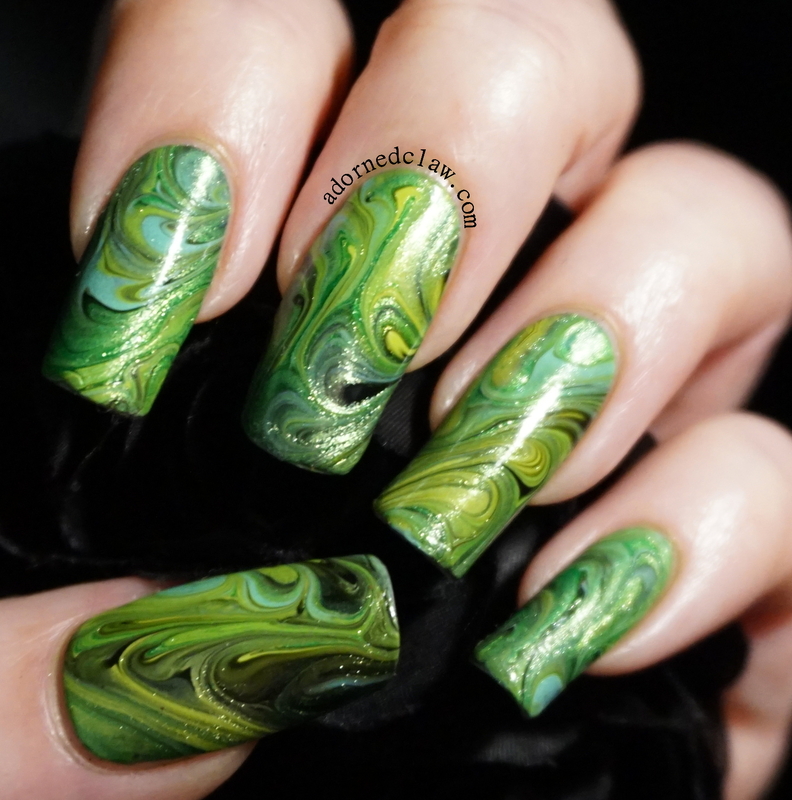 So to get this to marble nicely I had to use a huge amount of polish! The bottle of Near Dark was practically full when I started! 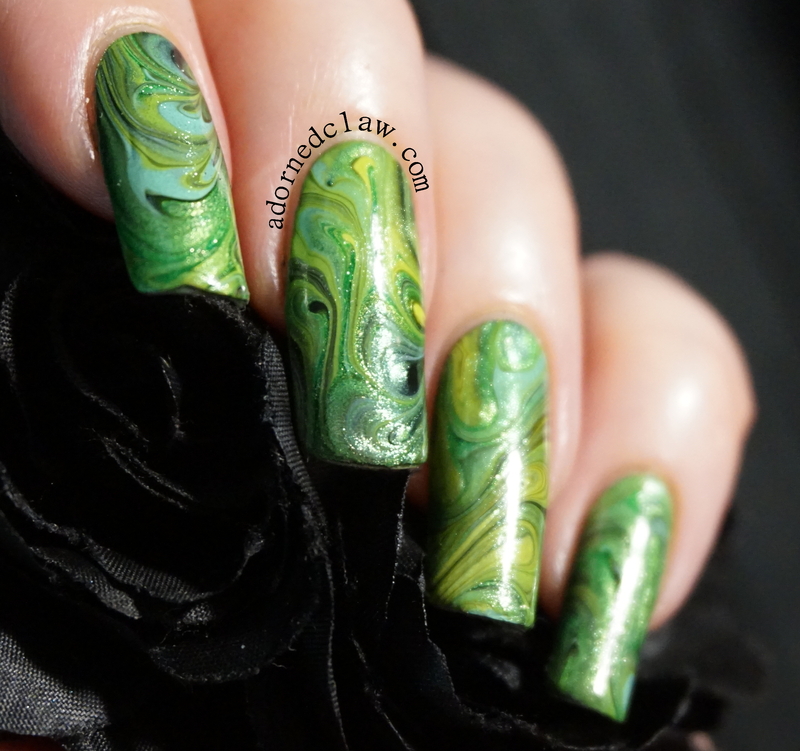 Instead of painting stripes I painted A big rectangle of the darkest polish then dripped the other colours onto it, and then used the comb to make the swirly patterns! 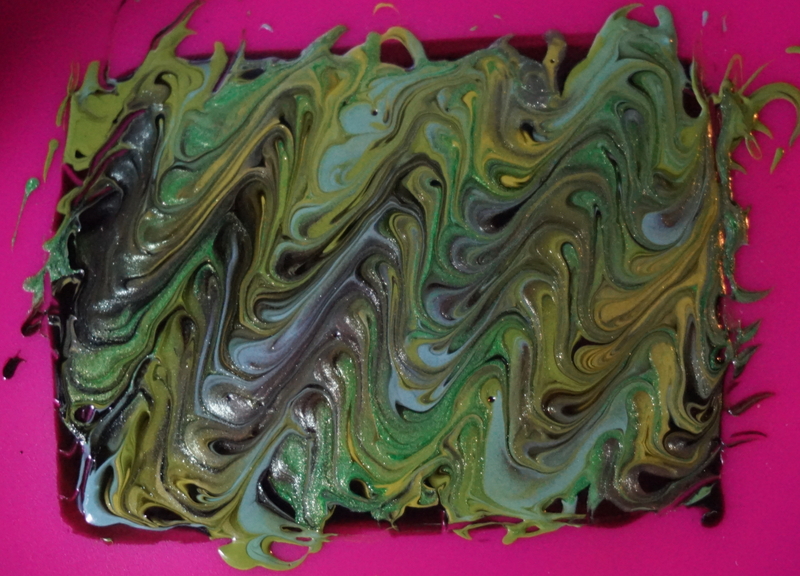 This took such a long time to dry! Around 8 hours! 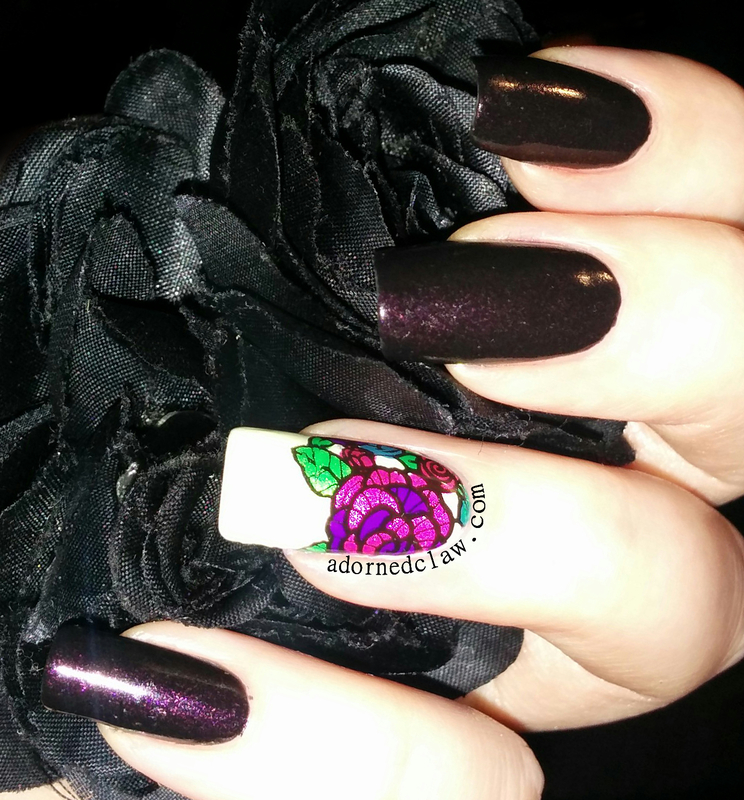 But because the decal was so huge I had more than enough to cut to size! 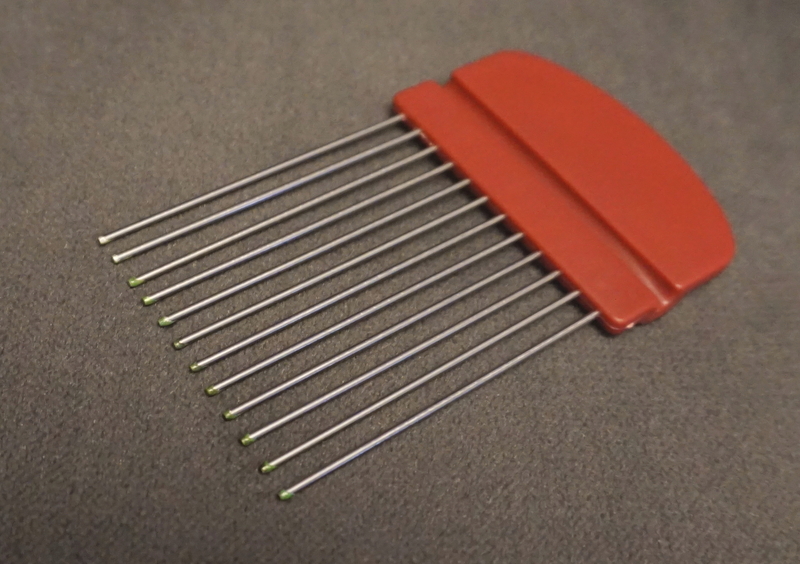 I don’t know if I’ll be using the comb often just because of the amount of polish I had to use to get it to work, But when I had figured out how to get great results from it, the comb really is a product that’s really fun to use! 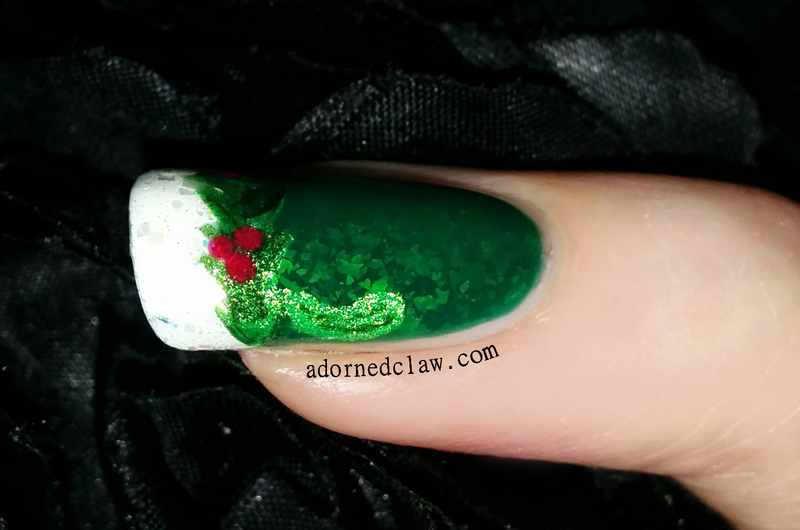 What is the Christmas Pickle? Is it a lucky pickle? If you are lucky enough to find this mystical vegetable are you blessed with a year of produce in jars? Or even a deluge of vinegar based condiments! Ugh I have so many questions. And the smallest dotting tool I own. 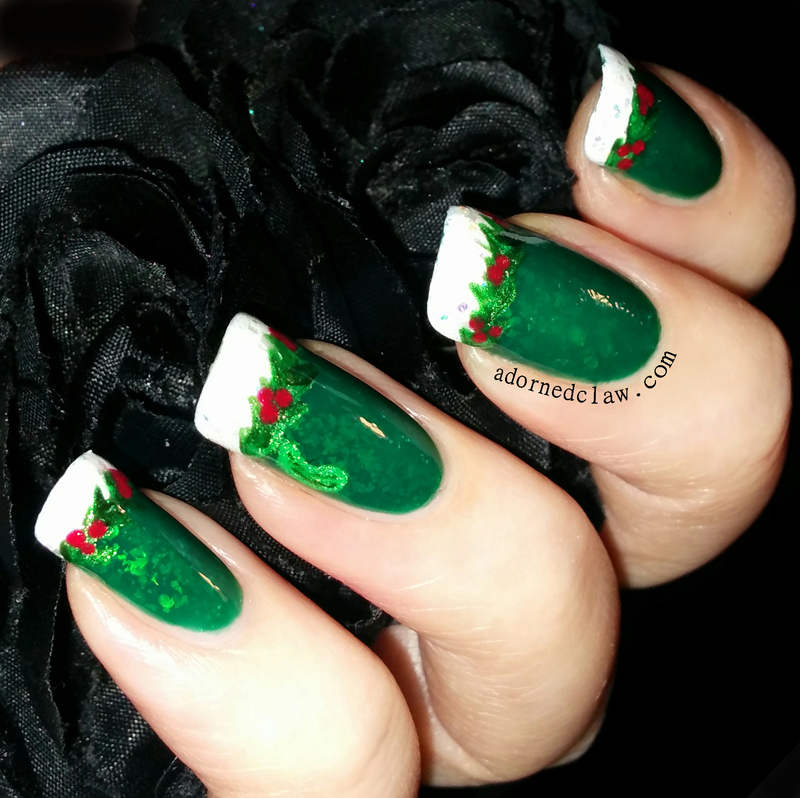 I started with three coats of Samba for the base and Snow Me White for the french tip, when this had dried I applied a little Chill Out over the tips. It really does look like sparkly snow, it really is a very pretty polish. 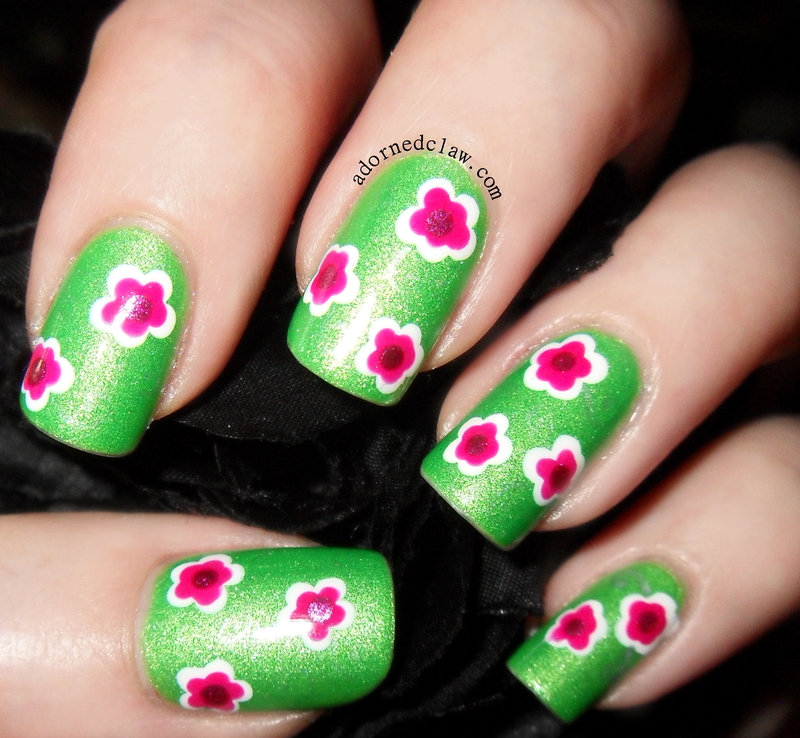 The branches are a mixture of Omen, Rain Forest and Logan applied with a thin brush. 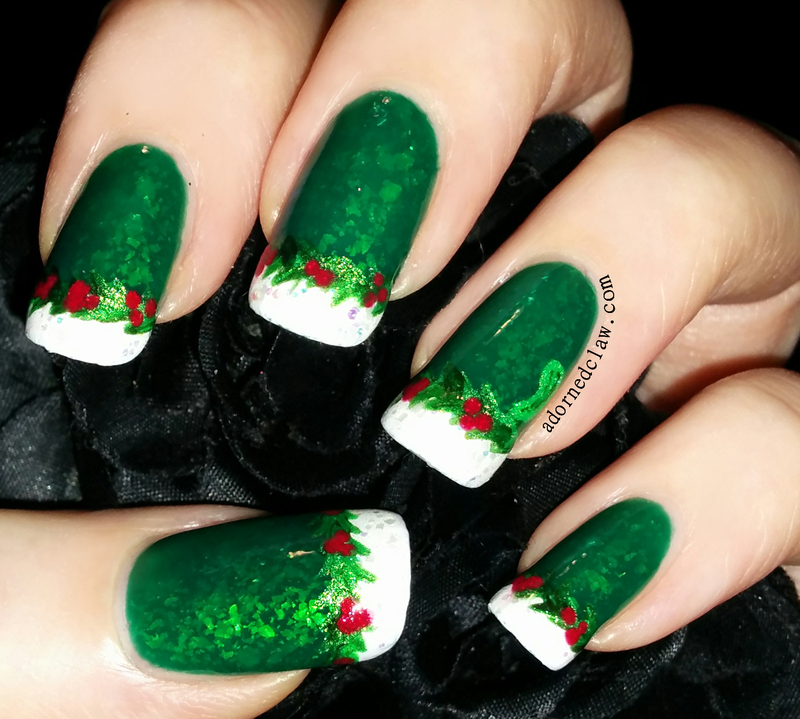 The little berries are a mixture of Barry M Red Glitter and Tip Your Hat, I had to mix the glitter in with another red as it’s getting old and stringy and I’ve run out of polish thinner (bad times!). 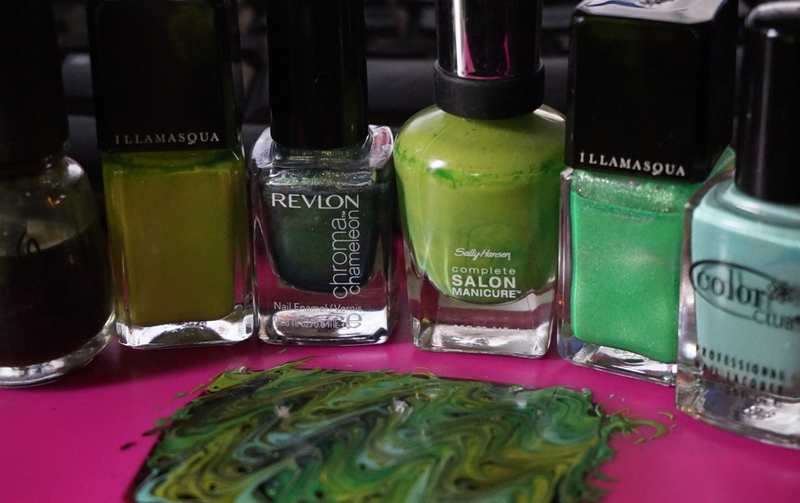 The pickle is Omen from Illamasqua with a couple of stripes of Rain Forest! 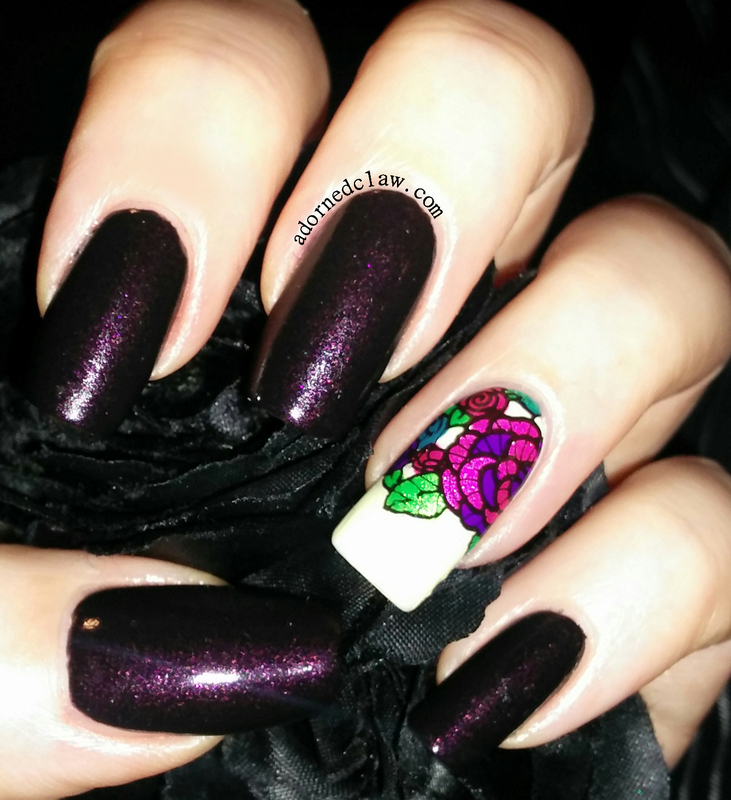 I used a lot of glitter polishes in this mani and it needed a couple of coats of Seche Vite to give it a glassy smooth finish! 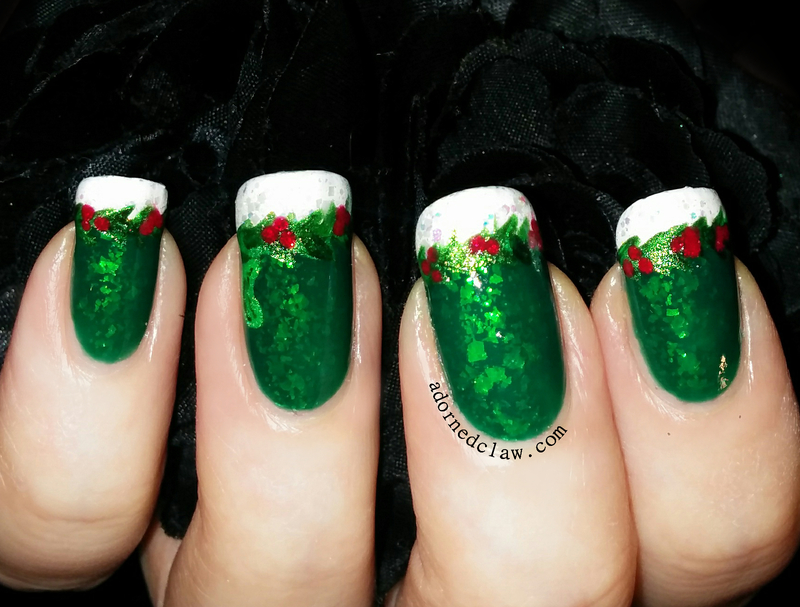 I think that this is actually the most festive mani I have created this holiday season! 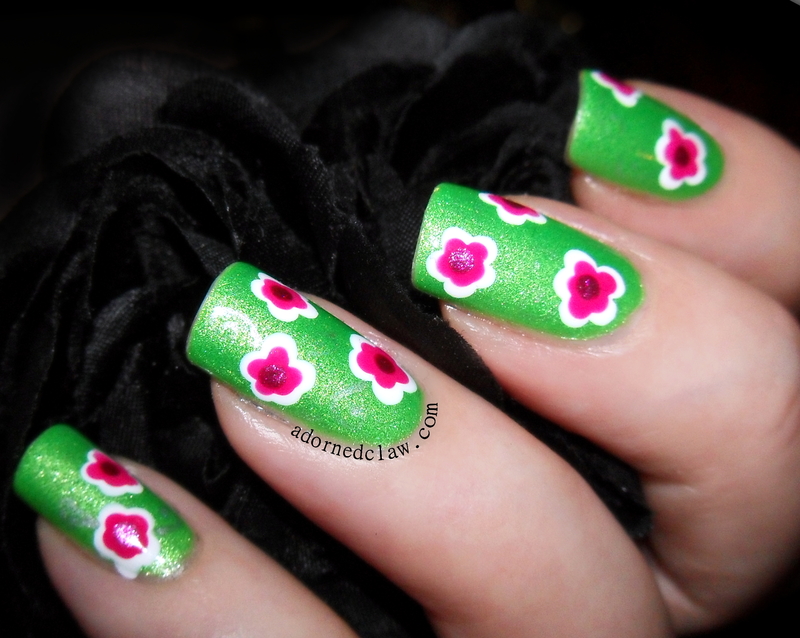 If you would like to see some more amazing Holiday nail art be sure to have a look at the HPB link up below! 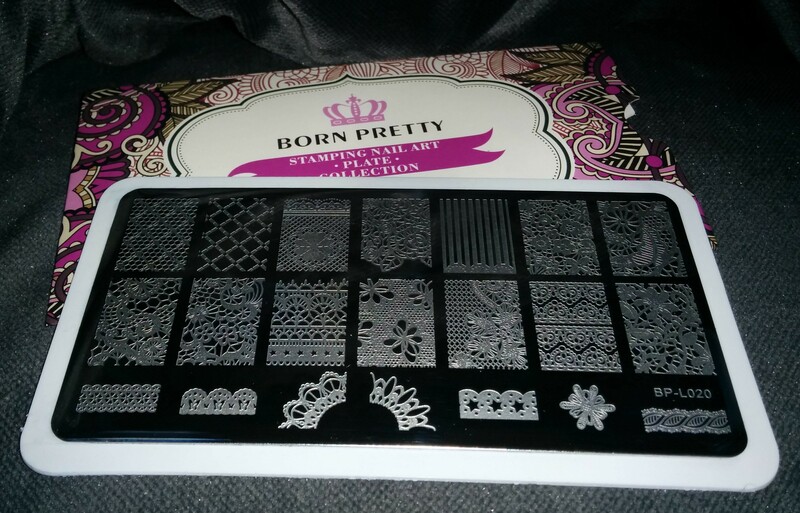 Here is a pretty lace stamping plate that has been sent to me from Born Pretty! 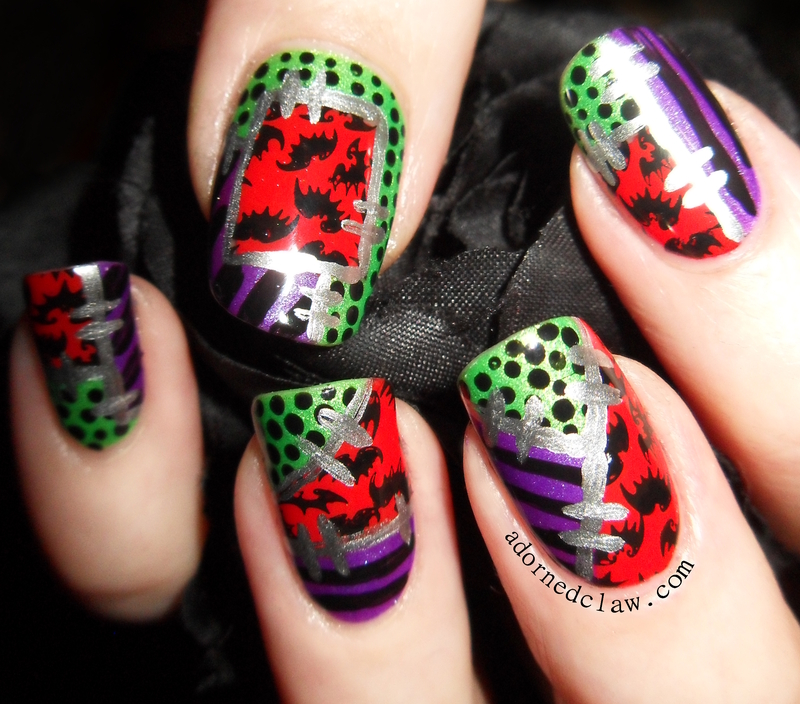 You can find the plate right here Lace Stamping Plate. 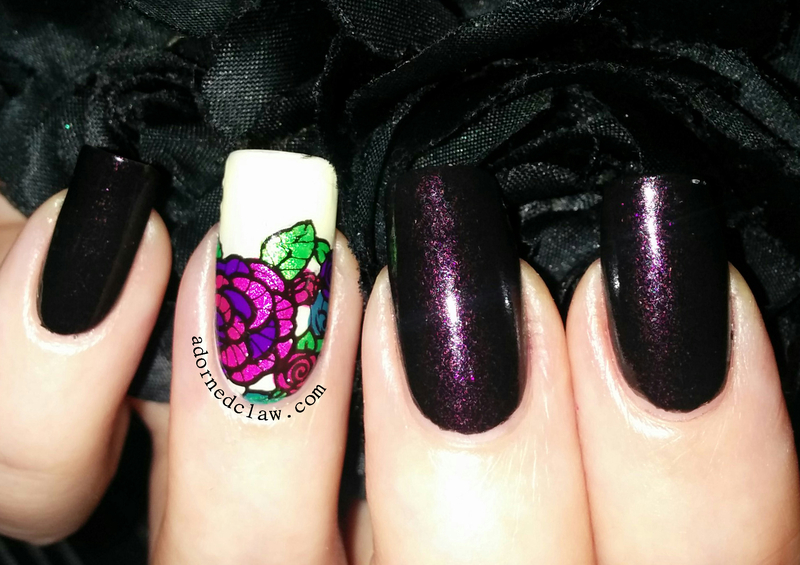 The first thing I have to mention is the image on the Born Pretty store page is a slightly different plate, so for my review I’m using an image that’s the same on my plate BP-L020 and the one on the website. There are loads of really lovely images on this plate, a lot of them perfect for leadlighting and reverse stamping. 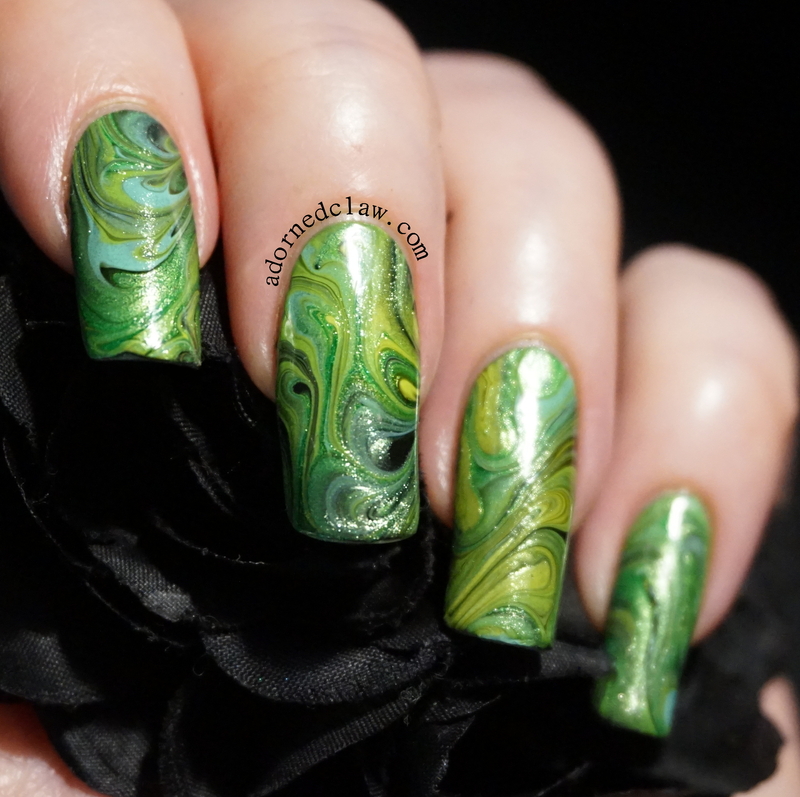 While I was playing with this plate I noticed that to fit the images on my thumb I had to stretch the image, for the most part it was fine but the the images with more detail ended up looking rather distorted. Another thing I found, was that I got a much cleaner image pickup by scraping across the plate, so side to side rather than up and down. I have no idea why! 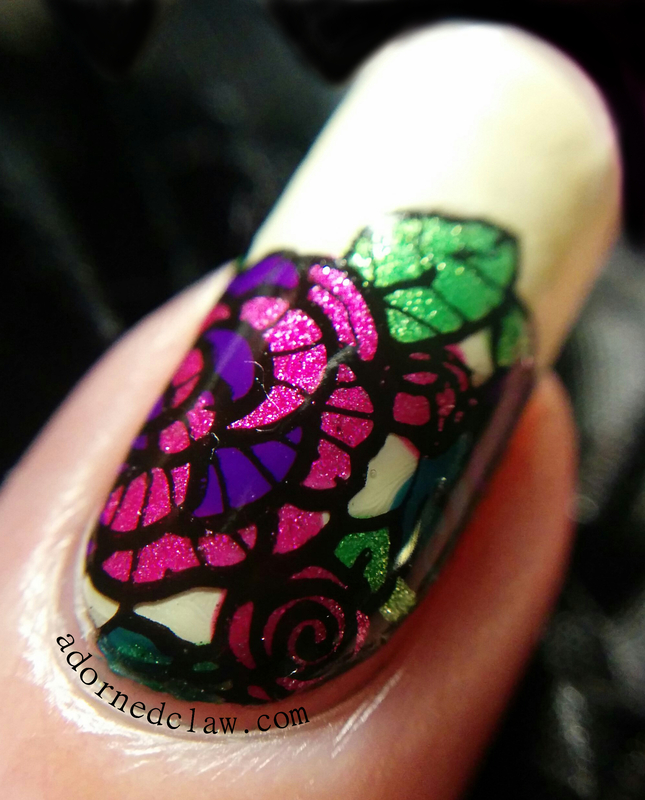 This is a really pretty plate, if the images where a couple of mm wider it would be the perfect size! 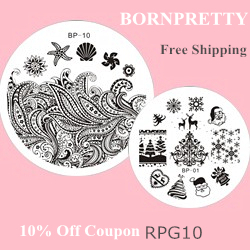 You can use the code RPG10 for 10% off your Born Pretty order! 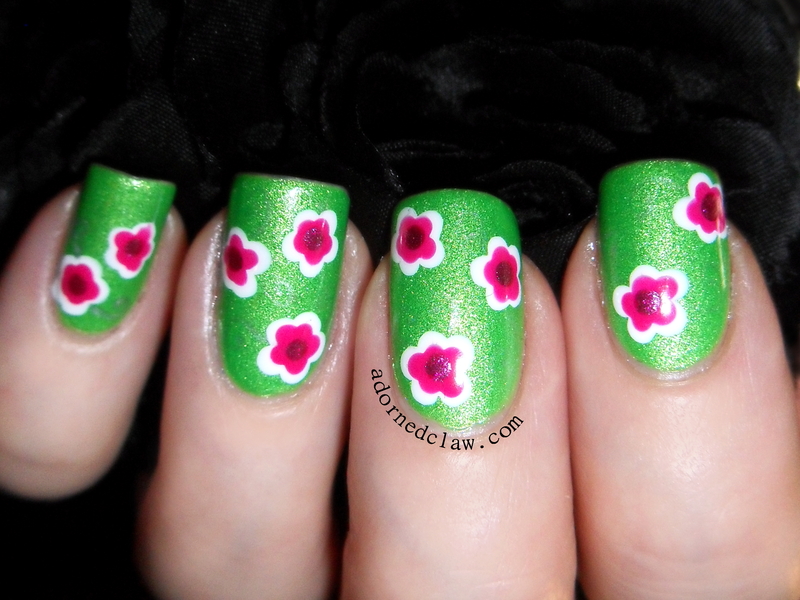 Just a quick post today, as these nails took way longer than I originally thought! 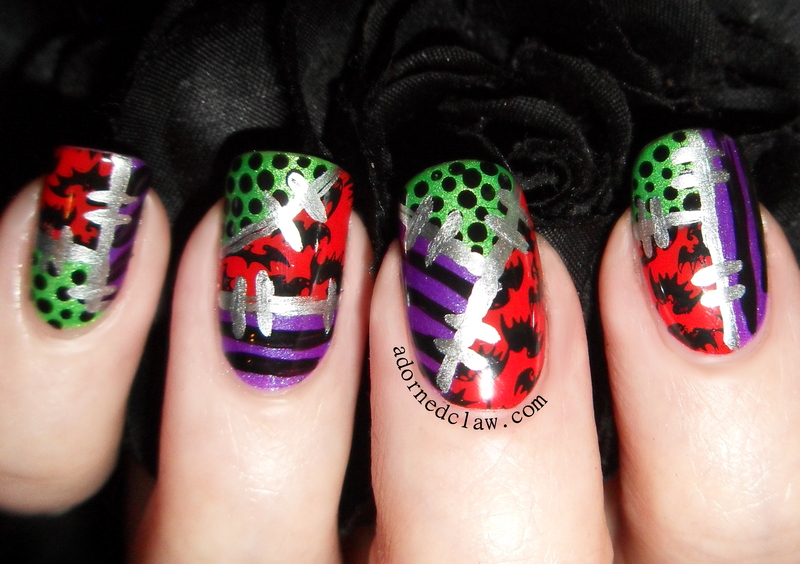 Here are my Patchwork Halloween nails! 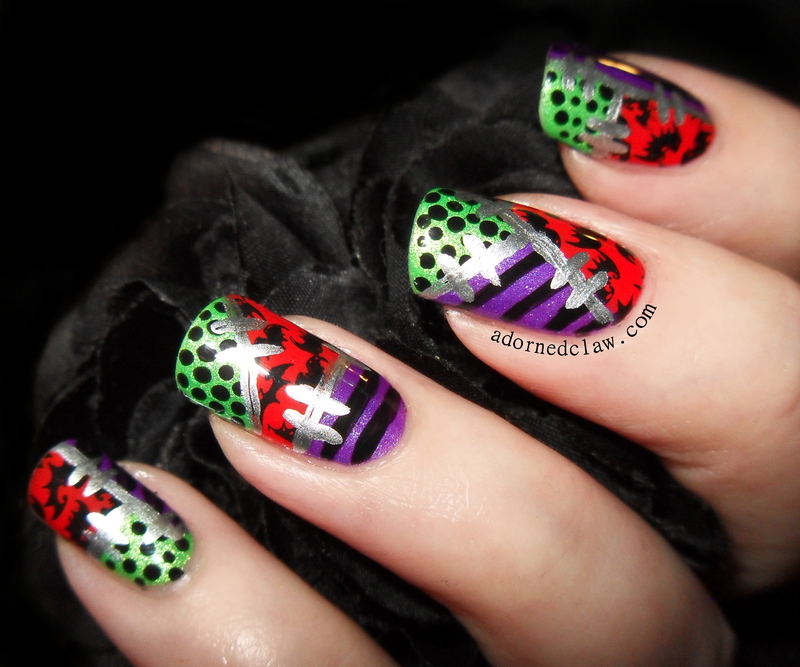 I think these are cute and I really think they have a cartoon like look, they’re definitely not scary lol!